Hailsham based charity “Computers for Charities” this week unveils the charities updated logo to mark 22 years of service to the community and voluntary sector. Chairman and founder Simon Rooksby says it is difficult to understand where the time has gone and the many developments that have taken place over the years. It all began in the loft of my home and has just continued to grow, no longer occupying the loft but operating from dedicated workshops the charities support has also changed from local to global. Over 250,000 computer systems have been donated primarily from corporate sources and Educational establishments including Sussex University; African schools on Line educational program is just one of many programmes the charity has pioneered providing computer access to over 100,000 children and the list goes on. Over the years the charities aims and support have changed in response to the varying need that has been requested. However as Simon says it is not all about Computers, as the charities new slogan states it is “Passionate about People”. Since day one the charity has operated largely unfunded and totally through the support of volunteers, which continues to this day. Operating an open door policy the charity works with a number of agencies including the Eastbourne Job Centre providing work experience opportunities to the long term and youth unemployed. Other organisations as with Choices utilise the charities resources to provide opportunities for folk with learning disabilities, Autism, Physical handicap, Mental health and probation to aid personal development and value. 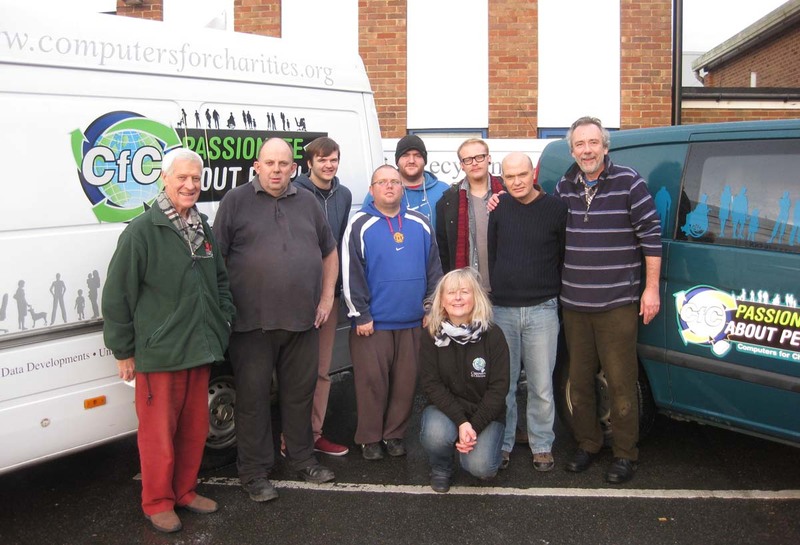 Christmas Shoebox appeal, humanitarian aid, Hailsham Food bank are just some of the facets of the charities support. Simon says it is not just sponsorship from the big companies that has made all this happen, local companies as with Chilli Graphics aiding the updating of our vans or Chandlers BMW and Rossetts UK with keeping our vehicles on the road. More help, especially financial is needed as we seek to cover day to day running costs, let alone find suitable investment to offer wider support locally and nationally given the continuing growing need. Which remains in total contrast to recent political comments of a new austerity with wages outstripping inflation. This is certainly not a phenomena experienced by the bulk of folks coming through our doors. Zero hour contracts, benefits issues, continued cuts to community services combined with increasing numbers of people seeking access to a heavily pruned service represent further support provided by the charity sector.